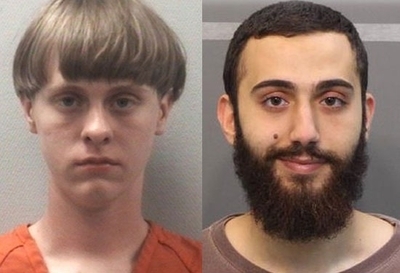 Dylann Roof and Mohammad Youssef Abdulazeez have a lot in common. Their terrorism shocked the nation, creating a uniform sense of profound sadness, pain and confusion. Both young men thought they were justified in arming themselves to the teeth and trying to slaughter as many of their fellow Americans as possible. This, they believed, would advance their individual causes. For Roof, that cause was white supremacy. He took nine innocent lives inside a church because they were black. The FBI says it still is trying to determine precisely what Abdulazeez thought he was doing. Investigators reportedly are trying to learn more about a months-long visit Abdulazeez made to Jordan last year. Reports indicate that law enforcement has found no evidence he acted in concert with anyone else. But his murder of four U.S. Marines in Chattanooga Thursday came in culminating days of Ramadan, the Muslim holy month, which Islamic State terrorists have used to call for waves of attacks on just about anyone, anywhere. "Muslims everywhere, we congratulate you over the arrival of the holy month," ISIS spokesman Abu Muhammad al-Adnani said in a recording last month. "Be keen to conquer in this holy month and to become exposed to martyrdom." In a blog he posted just three days before the attack, Abdulazeez wrote about the companions of Islam's prophet Muhammad, "Every one of them fought Jihad for the sake of Allah," he wrote. "Every one of them had to make sacrifices in their lives." Because Abdulazeez targeted a military recruiting center and training facility, the obvious question is whether he was inspired by the Islamic State (ISIS) or other jihadist groups. The president ordered security bolstered at Defense Department facilities in case other people planned similar terrorist attacks. Roof's terrorist attack at Charleston, S.C.'s historic Emmanuel African Methodist Episcopal Church last month focused attention on the violent threat from other domestic sources, racists, anti-government "sovereign citizens" and others. A New York Times story focused on researchers who believe that threat has been underestimated while the threat from radical jihadists "has been overblown." That assertion seems more difficult to support today. Since May 1, we have seen two heavily-armed gunmen die as they tried to storm a contest involving cartoons depicting Muhammad. Boston police and the FBI shot and killed Usaama Rahim after Rahim lunged at them with a military knife. Earlier, authorities heard Rahim tell an associate he was "going to ah go after them, those boys in blue." Rahim also "liked" ISIS on his Facebook page and published other statements embracing radical Islam and jihad. FBI Director James Comey says arrests in several other cases likely prevented attacks around Independence Day weekend. Now we have Abdulazeez. His death toll might have been higher if not for the swift, effective response of local law enforcement in Tennessee. The Times story cites data from the New America Foundation indicating that, since Sept. 12, 2001, "nearly twice as many people have been killed by white supremacists, antigovernment fanatics and other non-Muslim extremists than by radical Muslims." That's a convenient starting date. And the data can be influenced by factors ranging from effective law enforcement interdicting plots before they become attacks to simple, dumb luck. If Tamerlan and Dzhokhar Tsarnaev had one more accomplice, if would-be Times Square Faisal Shahzad or underwear bomber Umar Farouk Abdulmutallab had just a little more sophistication, had organizers of that Muhammad cartoon contest in Garland scrimped on security costs, that death toll might quickly flip in favor of killings by Islamists. Would watchdogs of racist/anti-government terror accept arguments that their threat is somehow overblown? Of course not. It is a macabre race for supremacy that benefits no one. Both are real threats. Law enforcement should take each seriously. Abdulazeez's attack fits a pattern of other Islamist terror strikes, attempted and successful, in the United States. In 2009, Nidal Hasan murdered 13 people, mostly his fellow soldiers, at Fort Hood after getting the blessing of American-born al-Qaida cleric Anwar al-Awlaki. That same year, Carlos Bledsoe converted to Islam and appears to have been radicalized in Yemen before he opened fire on a Little Rock army recruiting office, killing Army Pvt. William Long and wounding Army Pvt. Quinton Ezeagwula. Two years later, Naser Jason Abdo was arrested with explosive materials and weapons at a Texas motel near Fort Hood. He planned to detonate a bomb outside a restaurant popular with base personnel, and then shoot as many survivors as possible. He was stopped, thanks to an alert gun store clerk who called police. When his distraught mother asked why he did it, Abdo explained: "The reason is religion, Mom." As a Muslim, he said he had to do something in response to American military actions in Afghanistan and Iraq. "When bad things are happening," he said, "you have to do something about it." Dzhokhar Tsarnaev offered a similar justification for the Boston Marathon bombing, scrawling a note as he hid from police, writing: "The U.S. Government is killing our innocent civilians ... I can't stand to see such evil go unpunished, we Muslims are one body, you hurt one you hurt us all, well at least that's how Muhammad (pbuh) wanted it." ISIS claimed responsibility for the failed Garland, Texas shooting. Reports indicate that gunman Elton Simpson may have been in communication with ISIS recruiters or supporters before driving from his Arizona home with Nadir Soofi to Texas, dreaming of slaughtering as many people as they could. In short, if there are fewer American dead from Islamic jihadists than from American racists and anti-government fanatics, it is not because the threat doesn't exist or somehow is exaggerated. Saying the Islamist threat is potentially greater in no way diminishes the horror Dylann Roof unleashed at Emanuel African Methodist Episcopal Church. And it should not be seen as an argument that law enforcement should ignore the threats posed by white supremacists, "sovereign citizen" adherents who believe they are outside legal jurisdiction, or other violent anti-government ideologies. Roof hated black people, believing they "raped our women, and ... are taking over the country." But thus far, law enforcement has not identified any organized movement which urged him to kill. There seems to be no communication with racist leaders who actively tried to help him carry out the slaughter. For susceptible Muslims, those messages are ubiquitous, dating back to Awlaki and al-Qaida, and updated daily by ISIS. Yet, despite the best efforts of law enforcement, reports indicate Abdulazeez was unknown to the FBI before he started shooting Thursday. An overblown threat? It was all too real for Gunnery Sgt. Thomas J. Sullivan, Staff Sgt. David A. Wyatt, Sgt. Carson Holmquist and Skip Wells, not to mention their grieving families and friends. Please, advocates of this claim, tell us how many dead Americans it will take before we reach the threshold of a legitimate threat. WARNING: POLITICALLY INCORRECT CONTENT The American mass media - with the possible exception of talk radio - is engaged in the complete destruction of American values. The most subtle and pernicious tactic promulgated by those that would fundamentally transform America is political correctness, in all its perversions. They ALL transgress the U.S. Constitution's First Amendment, which was so important that the Founders made it the very FIRST amendment. The NY Times story about white supremacists being more dangerous than Islamic terrorism is a blatant example of the unwillingness to recognize reality and to instead deflect our attention to something else. It is simply "not PC" to call fundamentalist Islamic terrorism what it is, or even to acknowledge it. There are myriad examples of the redefinition of words to mean something different, including "discrimination", which used to mean merely the ability to tell the difference between things. "Discriminating tastes" used to be a desirable ability to tell the difference between merely acceptable and excellent. From that perversion comes twisting of "racisim," which used to mean treating someone differently because of the color of their skin. The Rev. Dr. Martin Luther King, Jr. dreamed of a colorblind society in which his children would be judged not by the color of their skin, but by the content of their character, yet the advocacy of colorblindness has now been called by the PC media as code for racism itself. Without the correct words to call a thing what it is, we have no basis for a rational understanding of our world. Similarly, the creative characterization of the Ft. Hood massacre by an Islamic-American soldier shouting "Allahu Akbar" as merely workplace violence misses the truth by a moon-shot. The Garland, TX assault on the "Draw Mohammad" cartoon contest was even represented sympathetically by the major media, and the cartoonists engaging in the protection of the First Amendment for political statements were vilified as the problem. If anything could illustrate the assault on American values better, I can't imagine what it might be. By the way, the cartoon that won that contest was a depiction of a turbanned, scimitar-wielding figure proclaiming "You Can't Draw Me! ", and a pair of hands wielding only a pencil saying quietly "That's Why I Draw You." Bet you didn't hear anything about that in the pop-culture media. Poignantly, that cartoon was created by a former Muslim who has devoted his post-awakening life to telling the truth about Islam, named Bosch Fawstin. Have you heard anywhere that both Fawstin and the event's organizer, American Freedom Defense Initiative founder Pamela Geller, now have an Islamic fatwah against them. In mafiosi terms, it's called a "contract." Since the media has largely abdicated its constitutionally-protected duty to tell the truth in favor of advocating its twisting, it is up to each of us to use the words that accurately describe things in our world, and to stand up for the common-sense meanings of those words. Where does it end? It doesn't, without us that recognize the problem, and the threat it poses to the west doing something to stop it. If we allow the anti-American values crowd to limit the words that can be used in the debate over America's future, American values - and those that believe in them - will be wiped off the face of the earth. Not just in our time, but for generations to come. Is that the world you want your children and grandchildren to have to live in? Especially in the United States of America? Don't surrender your Freedom of Speech! Don't be afraid to be called politically incorrect, racist or one or more of the many Islamophobic, homophobic, anti-government, ignorant gun-loving Christian or any of the other denigrating labels invented by those that would control us to intimidate us! Stand up for the truth and for reality and call things as you see them. The very first step is to take back the meaning of our words, and to tell others what we mean when we use them! America is in our hands. Never surrender! If Life, Liberty, and the Pursuit of Happiness are to survive as self-evident American values, it is up to each one of us! yes, FBI, Abdulazziz acted in concert with passages in the Quran that recommend killing infidels, and in concert with radical imams who recommend killing Westerners who are not muslims.